If you are not redirected please click the link below. Please take a moment to change your links and find us at our beautiful new home! Is there anything better than a best buddy? Especially for a child when life is so beautifully simple and giggling together is the true sign of friendship. And what could better than sharing a good book with a dear friend? These two came together for a little celebration of Olivia's birthday. They had adorable smiles to share! We put on this book party for them that morning...over a year and a half ago! For some reason it sat in the GreatStitch archives waiting for this moment when we could share it with you. 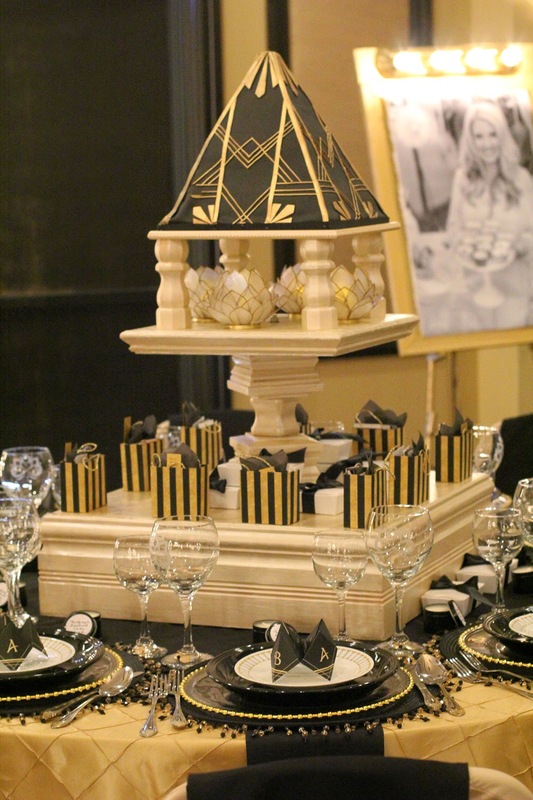 Our friend helped us with the styling and we loved the theme! Who wouldn't want to cozy up with a good book and some yummy snacks after a late night? And there is just something about a kid with a small tent-like space. 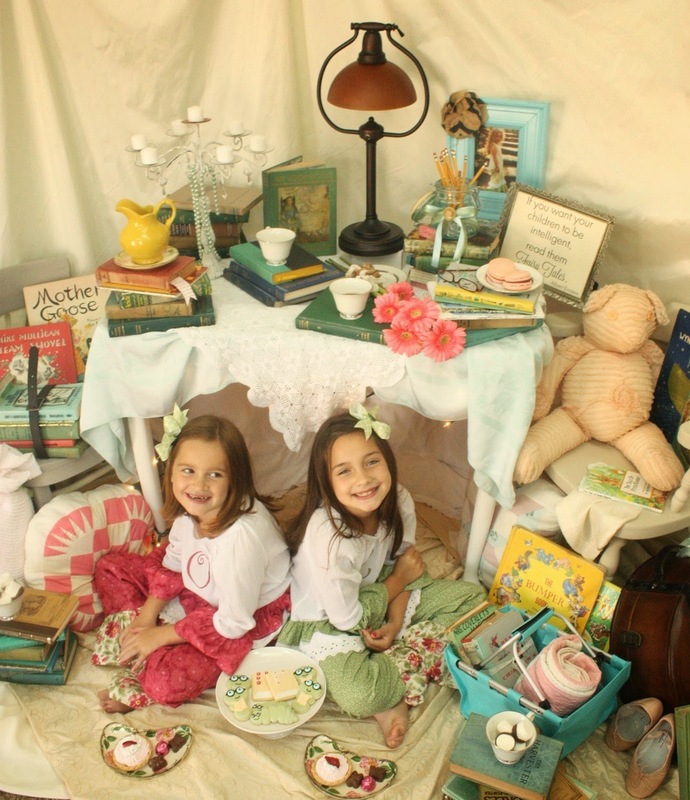 We used to make tents under two chairs and our kiddos would read and play under them for hours! Some things never go out of style. What is a party without some fun food? We found these tarts and chocolates at our local Reasor's Grocery Store. Lisa's Sweet Things made the adorable book worm cookies for our book party! The girls are wearing GreatStitch, too, of course! 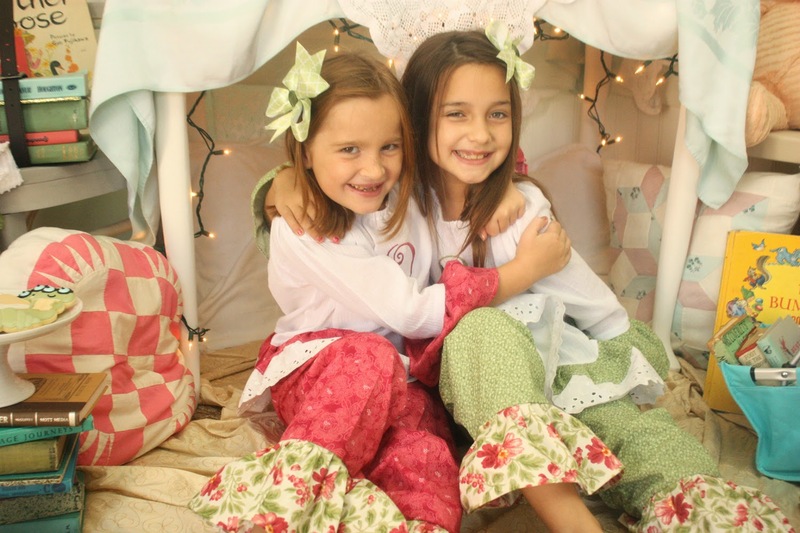 We made matching pants for their personalized ruffle peasant tops. They were so comfy for their cozy time together! The hair bows came from GreatStitch also. Speaking of bows, do you like our button bow? An easy DIY way to dress up a mason jar...or a vase...or a gift package! Those delicious macarons came from Whole Foods. And wouldn't you agree that any good book is made even better by a creamy, steamy cup of hot chocolate? I see kids reading real books less and less these days - they seem to be on their phones or tablets nonstop. So, we brought out the iPads loaded up with some books for these girls, just to show that reading can be fun on an iPad too! But really - there's nothing better than a good, old book. The girls had a lot of fun reading and laughing together. Don't forget to read to and with your kids. This is a treasured part of growing up that should never be lost. Albert Einstein said, "If you want your children to be intelligent, read them fairy tales!" I've told you my hubby is a writer. Over 20 years ago, he wrote the following short story about a society that went away from books. Turns out, it's hitting pretty close to home, nowadays. The three events of that third Friday in May had no visible connection, but taken together, they marked the culmination of a massive change in the world. It was on that Friday that the Browning Home Science Corporation in Palo Alto, California, announced the sale of its ten-billionth Personal Creation Home Kit. That same day, Joyce Carter came to corporate headquarters to claim her promised seat on the board of directors, and the Hirsch Memorial Library closed its doors. Only a few decades before, the world had been a very different place. Continued deforestation had brought massive drought and famine to the world. Population growth outpaced the ability of diplomacy to keep peace, especially as the resources to fuel modern society became scarcer. Political leaders, philosophers, historians and mystics sought the answers. But it was from science that salvation came. Reaching back to the groundbreaking work on personal fabrication done at MIT in the early part of the 21st century, Dr. Thomas Young, the greatest inventive genius since Edison, unlocked the DNA code to produce a creation/growth formula. Trees, plants, even animals could be created and brought to full maturity in days. Suddenly, the world’s problems changed dramatically. The hunger that had claimed so many lives became only a memory. The introduction of billions of trees ended drought, flooding, and replaced pollution with clean air. In many ways, it seemed a utopia. Governments fought to restrict the technology but popular demand quickly forced them to relent. The Browning Home Science Corporation was formed to take advantage of the commercial aspects of Dr. Young’s discovery by his childhood friend, Ben Browning. Though for obvious reasons the home kit was greatly restricted in power compared to the government version, it quickly became the most successful commercial product ever launched. Because of their exclusive licensing arrangement with Dr. Young, BHSC cornered the market and soon became the largest, most profitable corporation in history. Everyone wanted the ability to create. The creative sciences quickly became the field of choice in education. Young people in high school and even grade school cared for little else. New classes were established at universities to turn out teachers trained to instruct students in the use of the Personal Creation Home Kit. The decline in other areas of study was unforeseen. Students quickly turned from the humanities and learning about the past. Compared with the fervent thrill of creating plants and animals, learning the history of past wars and studying arcane philosophical debates held no interest. That change led directly to the closing of the libraries. As fewer people spent time reading, the libraries found demand for their services in sharp decline. When someone did want to read, the convenience of e-books kept them from needing to leave home. One by one, the public libraries closed their doors. No longer would children read and study, now, with their BHSC kits in hand, they would create. Joyce Carter saw the announcement of the final library’s closing on the news wall of the elevator as she rode to the 157th floor at BHSC headquarters, but her mind was elsewhere. Her day of triumph had arrived. Though some in the company had carped about the ease of marketing their products, she was justly proud of her campaign, and the ten billion unit sales goal she had reached. Joyce had been recruited by BHSC straight out of school. This was the world in which she had been shaped, and there she would change that world still further. She had shown a remarkable flair for creativity, and several of her scholastic projects had been patented. Her rapid rise at the company was driven in large part by her intense wonder at the possibilities of creation. On being given the top marketing position, she had built a worldwide marketing campaign around the company’s slogan “Any Fool Can Make a Tree.” She succeeded in the one thing many thought impossible—increasing interest further in the already wildly popular Personal Creation Home Kits. Her campaign tapped into the desire in every human heart to be the creator of something unique. She had been promised a seat on the board when sales reached ten billion units, and she had come to claim her prize. As she walked down the hall toward the boardroom, triumph mingled with wonder in her heart. She had reached the pinnacle of the world’s most profitable company. Even the top job there now might be within her reach when Dr. Browning retired in a few years. As she waited to enter and take her seat among the Browning directors, she saw one of her marketing brochures on the table and picked it up. More than ever before, the company’s slogan caught her eye. She mulled it briefly, wondering why she had never thought about its origin before. Pretty visionary, huh? I hope that we can get back to the books in the near future. It will always be a part of our family! Let's decide together that we will never let go of good books! This is how it all started - can you believe it? 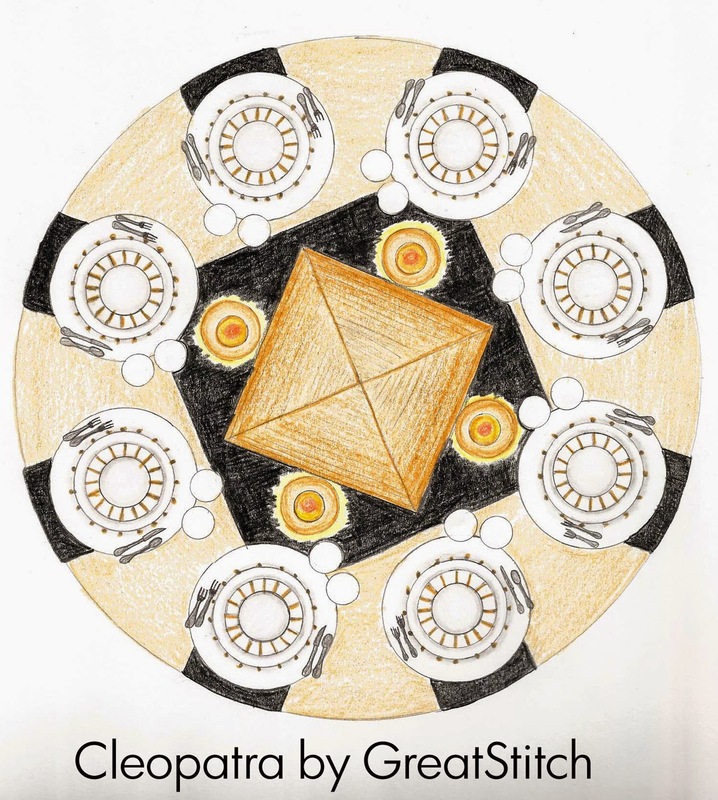 One afternoon I asked one of my helpers here at GreatStitch to draw this when we were brainstorming ideas for the BASH 2015 tabletop competition, and it became the blueprint of our Cleopatra entry. If you notice we had pretty much everything fleshed out that day, but then the center piece was left vague on purpose because at that time I had no idea what we were going to do! Thankfully we had many more days to prepare! 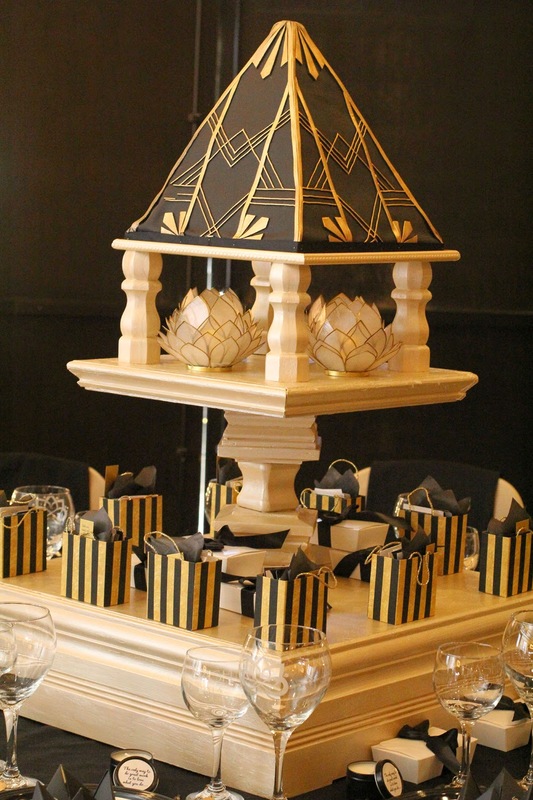 The biggest project in this adventure was our centerpiece with the pyramid cake on top. Believe it or not, we made it ourselves! I also did all the embroidery on everything on the table that has stitching, but I figured that wasn't DIY anymore since we do that all day every day! 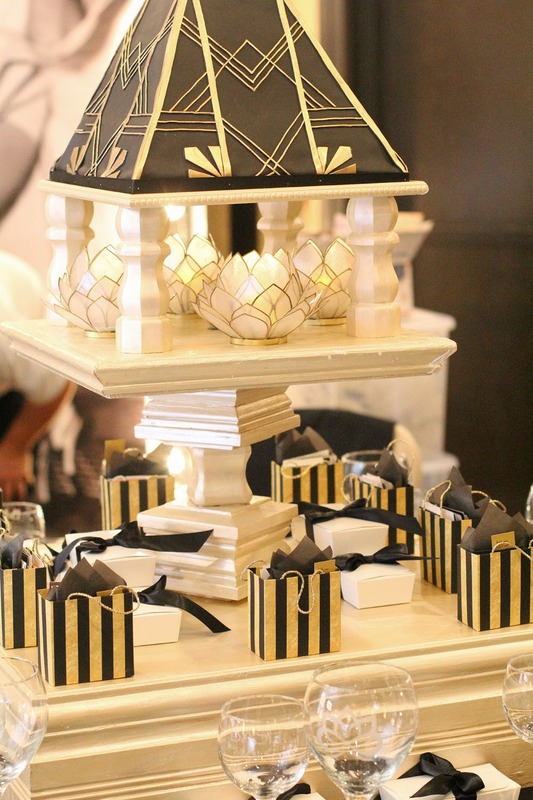 So keeping the pyramid shape in mind, we tapered the layers from the bottom to the top to culminate in our pyramid centerpiece cake topper. After a family outing to Home Depot, we built the cake stand together. My dad is pretty awesome figuring things out, and I'm so thankful for his expertise and willingness to help out. The pieces supporting the top two tiers are fence post caps stacked on top of one another! 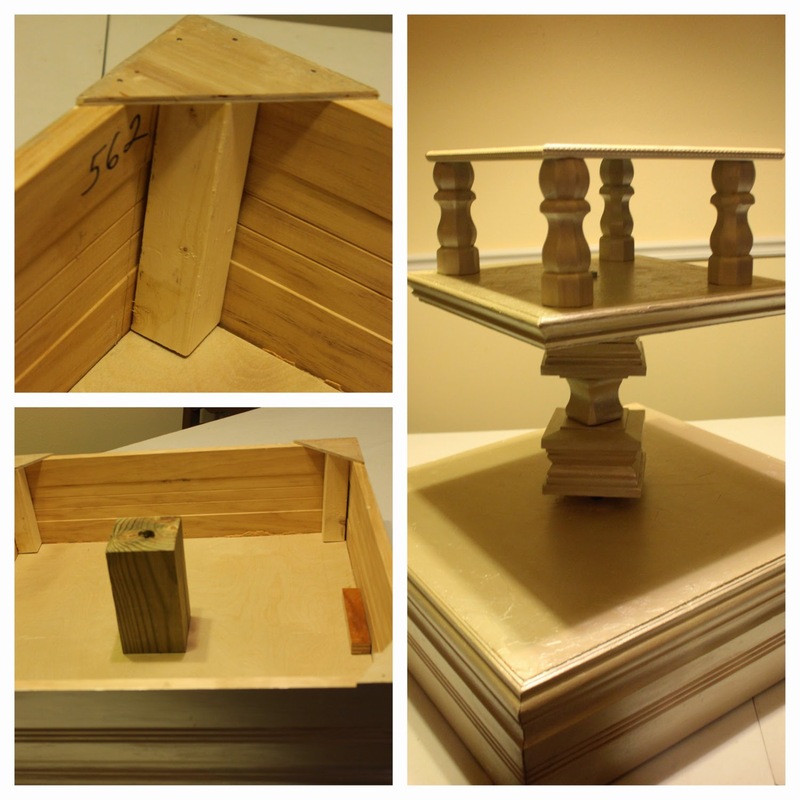 They created interest in the middle of the piece and saved us from having to miter all those extra corners! Each platform was made out of wall trim boards we mitered together. For the base, we ensured our corners were square by nailing the triangle pieces to one side, then the other, before ripping the middle board to fit in between it all and act as the platform. Extra support was provided by 2x2"s in the corners and a 6x6" piece of fence post at the base. 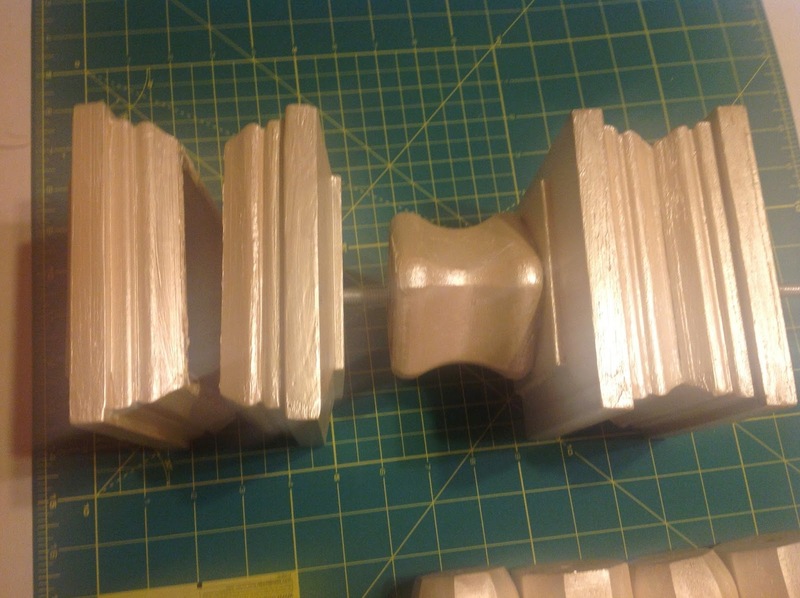 We also drilled through the entire height of the stand, fastening bolts at every layer to ensure its sturdiness. The amazing GypsyCanon painted (and photographed) the whole thing for us. I truly love the soft gold she created with layers of paint! Although this project was a little more work than we anticipated, it proved you can do anything yourself with a trip to the local hardware store and some elbow grease! This took us about 2 days as a family to knock it out. 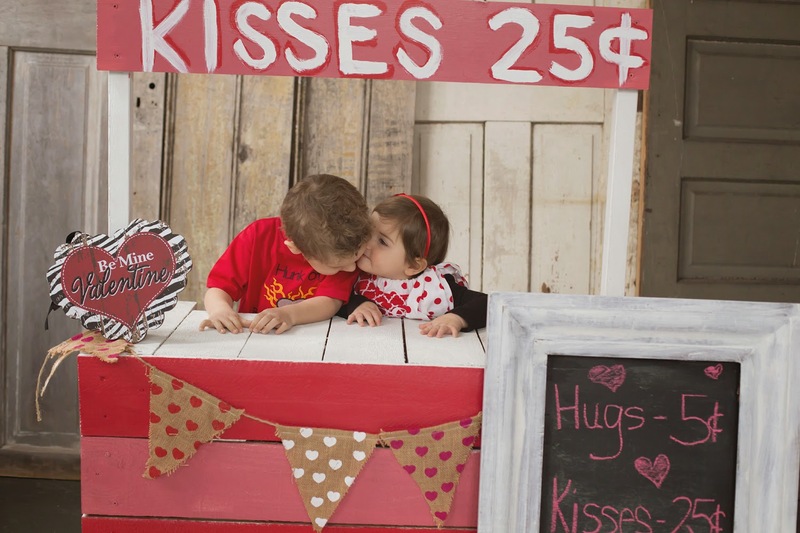 Is there anything sweeter than baby kisses? 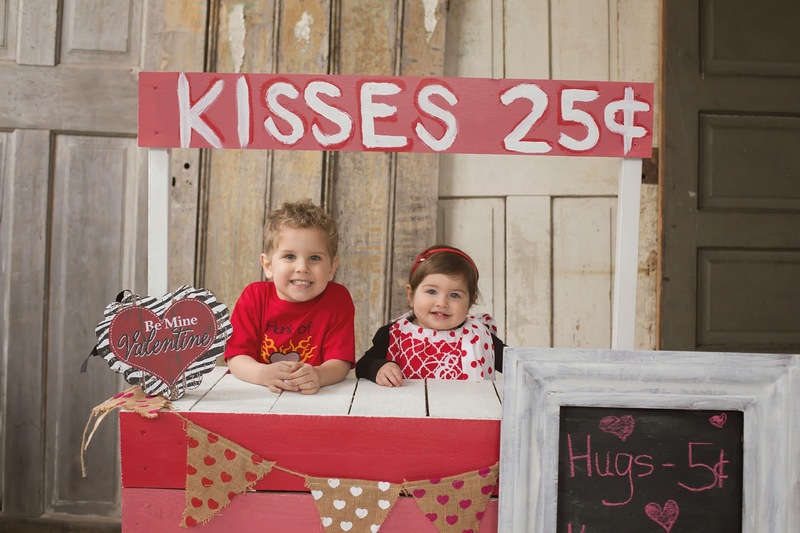 We were delighted to be able to partner with Danielle DeBorde Photography on this beautiful Valentine's photo shoot. Her kids are SO adorable, and it was a real pleasure for us to design and create outfits for them to wear. 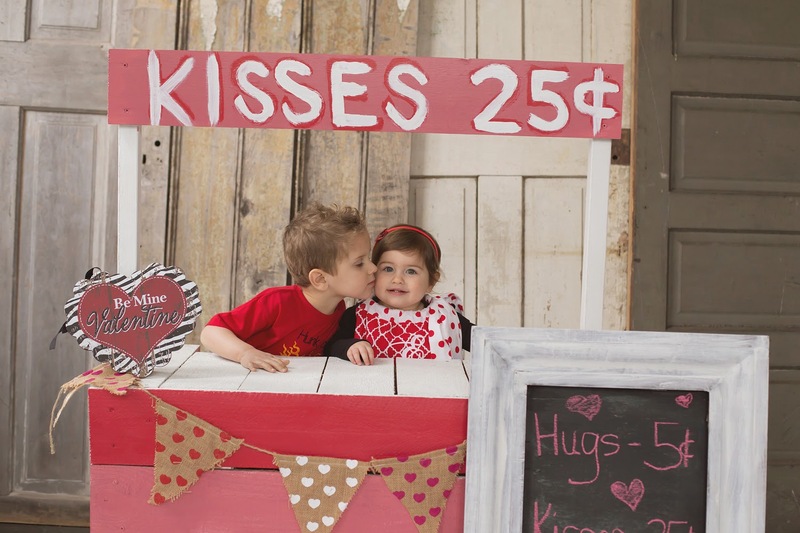 Danielle's kissing booth was such a fun setting for these pictures, and we are thrilled to see Jackson and Emma wearing GreatStitch. There is a certain innocence and sincerity in a sticky kiss or a smudged hand written Valentine from a little one that can never be recaptured. Looking at the precious faces of these two sweeties just makes my day! ...and we ended the day celebrating our anniversary. That's right - we got married on Valentine's Day! It's a day that should be made special, and we never wanted our kids to feel excluded! So every Valentine's day, to this day, we get them a small box of chocolates. Don't leave your kiddos out of the family celebration. Build a tradition with them. Traditions in a family are so good for them. They know what to expect. It may be cheesy, but they know they can count on it! 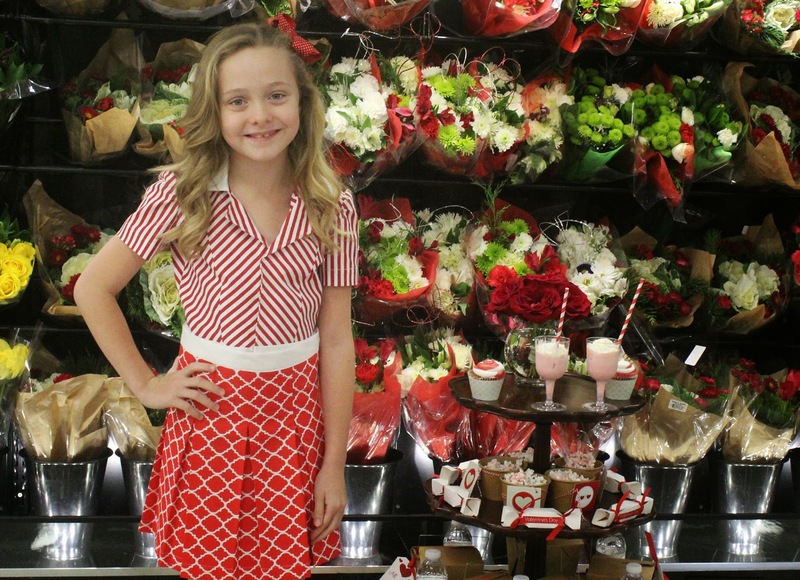 So to celebrate, what could be more fun on Valentine's Day than throwing a little party in a flower shop? 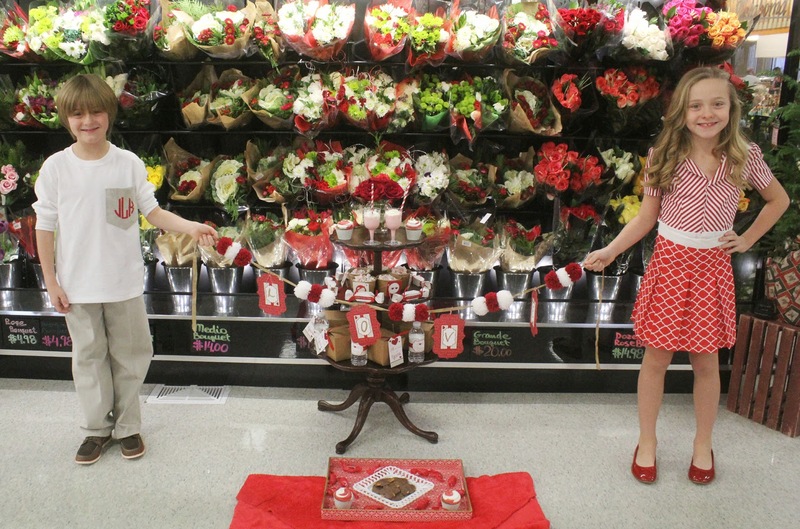 Surrounded by flowers of all shapes and sizes, we decided to ask our brother sister team to enjoy themselves in our local Reasor's store and take in their newly renovated space. 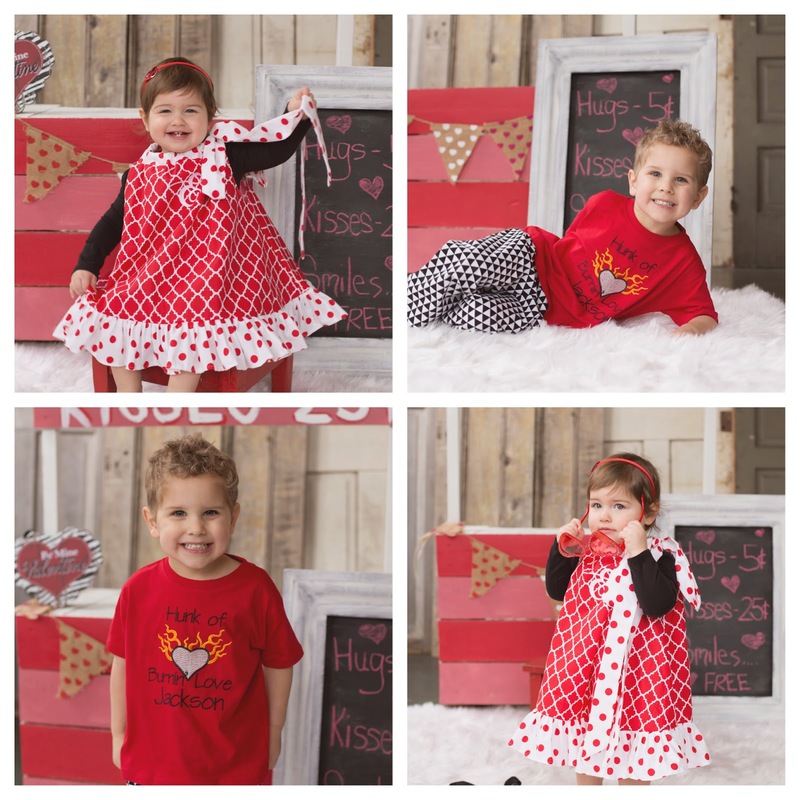 These lovely printables are all dressed up for Valentine's Day from Forever Your Prints! 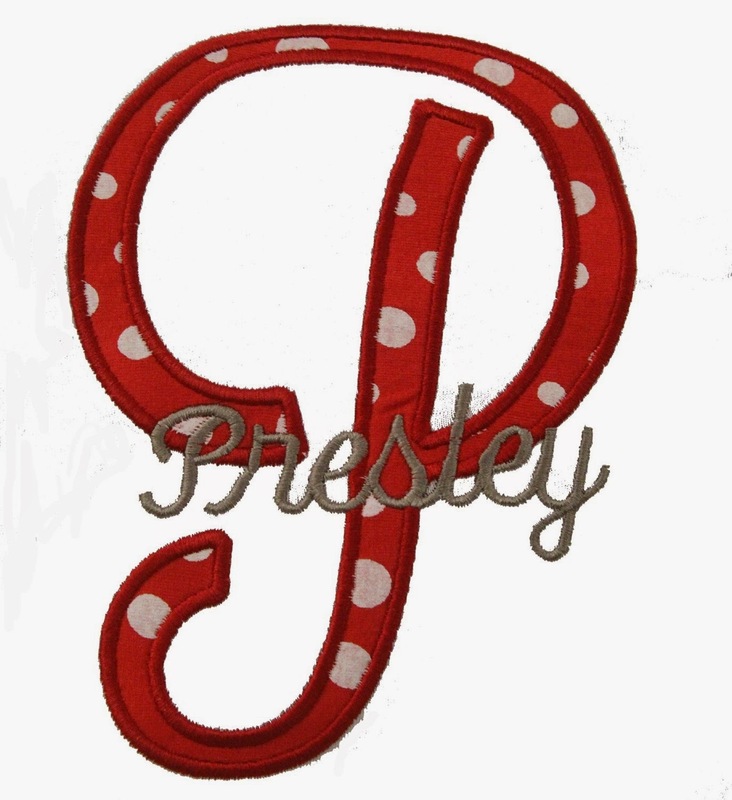 GreatStitch provided adorable outfits for Presley and Jackson. At Reasor's, they have a huge flower section, as many as any florist...in fact, don't tell, but I saw a local florist buying flowers from them! And the cheese shop...oh my! One of our new friends from BASH, Keisha Sibert of Cupcake Wishes Store, made this yarn banner for us! Her poms are so full and round it would make any banner beautiful! We just added the hand written letters on the paper from Forever Your Prints and we had the best banner around! We also found these festive (and delicious) cupcakes right in the store! GreatStitch made the shirts and pants. 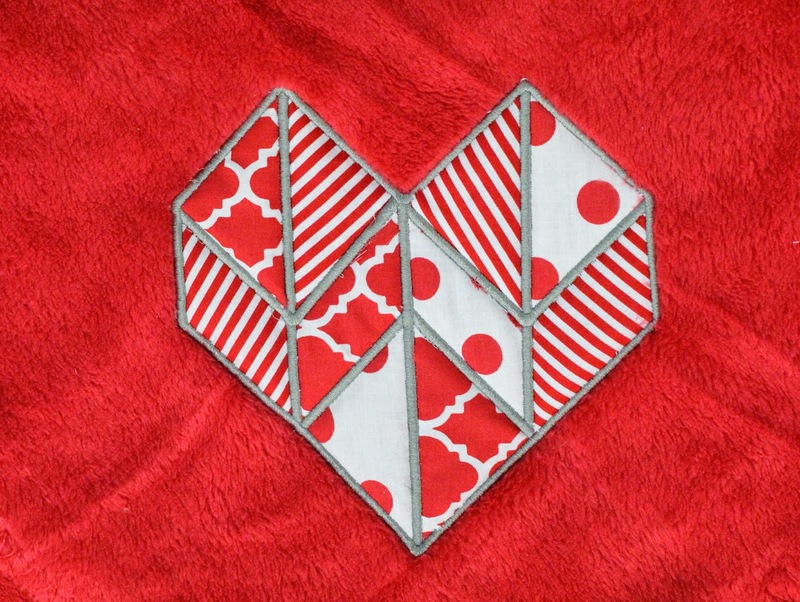 We did this design specifically for Valentine's Day to match the printables. Let us know if you have something you are trying to match colors on and we would be happy to help! For our ice cream sodas, we bought a "can" of ice cream. You push it from the bottom like a push up. It was quite fascinating! I suppose if you were desperate, you could just pump it right in to the mouth of a screaming child! Talking like a future grandma now, not a mom of course! A mom would never do that!! The other party treats came from the GreatStitch kitchen - We love to make goodies for our parties! Enmanuel Durant was born in Santa Cruz, Bolivia. After relocating to the United States, he has lived in Raleigh, Atlanta and Miami. A 6 year veteran of the United States Air Force who served 3 tours, including Operation Southern Watch and Iraqi Freedom, he began sewing and construction while serving in the US Air Force with various projects, including work on Air Force One. A fashion design graduate of Clary Sage College, he was also named outstanding fashion design student within his graduating class. He took top honors at the 2014 Tulsa State Fair, placing first in both fashion sketching and original fashion design. Along with serving on the staff of John Casablanca’s Tulsa office as an acting instructor, Enmanuel also sews, designs and embellishes for Broken Arrow based Great Stitch. An active member of the Miss Green Country and Miss Teen Green Country Scholarship Pageants boards he does custom design, reconstruction and alterations from his Tulsa studio. You can contact Manny at eman.durant@gmail.com if you are interested in the adorable dress below. He mostly focuses on adults, but we were so happy he came to help us on this party! I especially love the way he treated the stripe and matched it all up! We also made her brother a monogrammed pocket! They're all ready to cuddle up for a cozy night in...or after a fun night out. A fuzzy blanket from GreatStitch would make the perfect addition to your family fun! Our GreatStitch kiddos are so adorable! It may be the talented Gypsy Canon that makes them laugh we don't know, but there always seems to be a moment when everyone cracks up! So, we will end this Valentine's with a family laugh! Make sure you tell them you love them this Valentine's Day!! All of them! Even the littlest ones!